Discussion on Hadoop and its Architecture. This is for professionals/students who wish to understand - What is Big Data, What is Hadoop and Why Hadoop ! Also decoding Hadoop's role in solving the problems of Big Data with the existing Data Warehouse solutions based on traditional databases. You will also understand the details of Hadoop Architecture: the Hadoop Distributed File System ( HDFS) and MapReduce framework. The Tutorial covers in detail about Name Node, Data Nodes, Secondary Name Node. It goes into the details of concepts like Rack Awareness, Data Replication, Reading and Writing on HDFS. The channel is meant for professionals aiming to upgrade their knowledge and skills in Big Data frameworks / technologies like Hadoop, Data Science, Business Analytics, Machine Learning, No SQL Database. 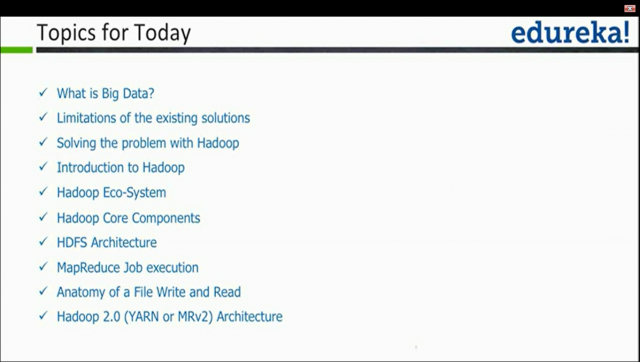 Title: Discussion on Hadoop and its Architecture.